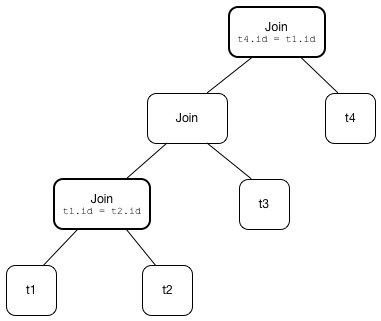 ReorderJoin is a logical optimization for join reordering. 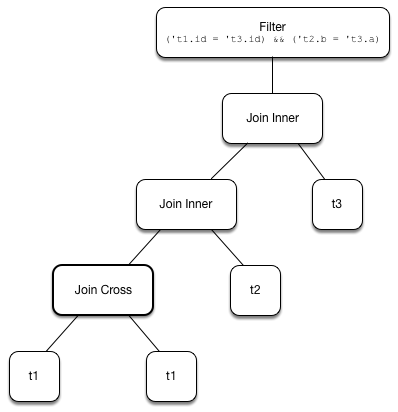 ReorderJoin applies the join optimizations on a logical plan with 2 or more inner and cross joins with at least one join condition. 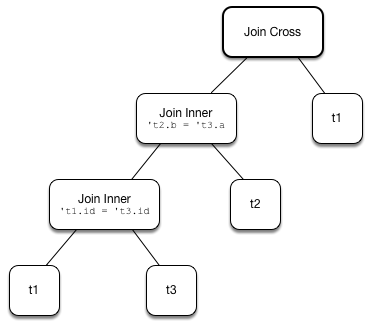 FIXME A diagram of a logical plan tree before and after the rule. Technically, ReorderJoin is a Catalyst rule for transforming logical plans, i.e. Rule[LogicalPlan]. ReorderJoin is part of the Operator Optimizations fixed-point batch in the standard batches of the Catalyst Optimizer. apply uses ExtractFiltersAndInnerJoins Scala extractor object (using unapply method) to "destructure" a logical plan to its logical operators. createOrderedJoin makes sure that the input has at least two pairs in the input. createOrderedJoin is used recursively when ReorderJoin is applied to a logical plan. For two joins exactly (i.e. the input has two logical plans and their join types), createOrderedJoin partitions (aka splits) the input condition expressions to the ones that can be evaluated within a join and not. createOrderedJoin determines the join type of the result join. It chooses inner if the left and right join types are both inner and cross otherwise. createOrderedJoin creates a Join logical operator with the input join conditions combined together using And expression and the join type (inner or cross). If there are condition expressions that could not be evaluated within a join, createOrderedJoin creates a Filter logical operator with the join conditions combined together using And expression and the result join operator as the child operator. where((col("p1.id") === col("t3.id")) && (col("t2.b") === col("t3.a"))). createOrderedJoin takes the plan that has at least one matching join condition if found or the next plan from the input plans. unapply is a feature of the Scala programming language to define extractor objects that take an object and try to give the arguments back. This is most often used in pattern matching and partial functions. For a Filter logical operator with a cross or inner Join child operator, unapply flattenJoin on the Filter. For a Join logical operator, unapply flattenJoin on the Join. unapply is used exclusively when ReorderJoin is executed, i.e. applied to a logical plan. For all other logical operators, flattenJoin gives the input plan, the current join type (an inner or cross join) and the empty join condition. In either case, flattenJoin splits conjunctive predicates, i.e. removes And expressions and gives their child expressions. where("t2.id".expr === "t1.id".expr && "t1.id".expr > 10). flattenJoin is used recursively when ReorderJoin is destructures a logical plan (when executed).